Separation barrier or separation wall "is a barrier, wall or fence constructed to limit the movement of people across a certain line or border, or to separate peoples or cultures. David Henley opines in The Guardian that separation barriers are being built at a record-rate around the world along borders and do not only surround dictatorships or pariah states. The term "separation barrier" has been applied to structures erected in Belfast, Homs, the West Bank, São Paulo, Cyprus, and along the Greece-Turkey border and the Mexico-United States border. Several erected separation barriers are no longer active or in place, including the Berlin Wall, the Maginot Line and some barrier sections in Jerusalem. " 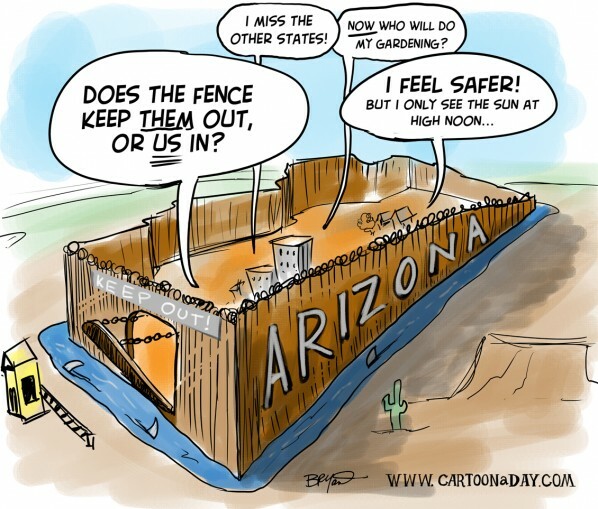 A border barrier "is a wall, berm, or fence constructed to limit the movement of people across a certain line or border. These structures vary in placement with regard to international borders and topography. Famous examples include the Great Wall of China, a series of walls separating the Empire of China from nomadic powers to the north and the Mexico–United States barrier." A gated community (or walled community) "is a form of residential community or housing estate containing strictly controlled entrances for pedestrians, bicycles, and automobiles, and often characterized by a closed perimeter of walls and fences. Gated communities usually consist of small residential streets and include various shared amenities. For smaller communities this may be only a park or other common area. For larger communities, it may be possible for residents to stay within the community for most daily activities. Gated communities are a type of common interest development, but are distinct from intentional communities. Given that gated communities are spatially a type of enclave, Setha M. Low, among other anthropologists, has argued that they have a negative effect on the net social capital of the broader community outside the gated community. Some gated communities, usually called guard-gated communities, are staffed by private security guards and are often home to high-value properties, and/or are set up as retirement villages. Some gated communities are secure enough to resemble fortresses and are intended as such." "Constructed 600 years ago from 350 million bricks, Nanjing’s wall has protected the city for centuries. Now, residents are returning the favour." How does Trump’s wall compare to 10 of the world’s most famous? "Barriers of concrete and stone don’t just divide people, they define identities, writes Roger Luckhurst." "Norway is erecting a controversial steel fence along its border post with Russia following a surge in migrant arrivals last year." Les murs, barrières ou clôtures pullulent depuis quelques années : cartographie de la fortification des frontières, et analyse d'un monde de plus en plus fermé. "Donald Trump may want to take note: World history is full of examples of engineering thwarted by goal-oriented rank amateurs." "Wall separating pro- and anti-impeachment rallies ahead of a vote on President Dilma Rousseff is a reminder nothing in the country is divided equally." Barriers - Readers' photographs on the theme of "barriers"
"A picture taken by D'Arcy Vachon of a guard dog outside Mexico City." "Hungary has begun building a fence on the country's border with Serbia to keep migrants out. Prime Minister Viktor Orban's right-wing government is staunchly opposed to most immigration from outside Europe. " Here is a selection of some of the walls and border fences worldwide. "In 2003, partially as a response to the threat of militants infiltrating in from Pakistan, India started to build a fenced border with Pakistan after reaching a cease-fire agreement." "One year ago, Russian troops reportedly started to build a wire fence between Georgia and South Ossetia..."
"The 40-mile-long border between the Gaza Strip and Israel is protected by Israeli guards and a barrier erected in 1994." To stop smugglers from using tunnels, the Egyptian government started to build an underground metal wall in 2009 — a project condemned as a 'wall of shame' by many Arab commentators..."
"Twelve years ago, Israel started to build a 420-mile-long wall that separates the country from the West Bank. It is five to eight meters tall and varies in form..."
"In 2006, construction started on a border fence separating the United States and Mexico after violence, drug-related crimes as well as illegal immigration surged..."
"To protect the zones and to prevent citizens from crossing the border, a barbed-wire fence was set up... "
"In 1986, the Indian Parliament approved the construction of a border fence to supposedly prevent illegal immigrants from entering — construction began in 1993..."
"The European Union has erected several fences that are supposed to prevent Middle Eastern and North African refugees from reaching a member state of the union..."
"One fence that separates E.U. land from other countries is in North Africa..."
"Cyprus, located south of Turkey, is separated by a U.N. buffer zone established in 1974 and a wall..."
"In Northern Ireland's Belfast, "peace walls" still separate Catholic and Protestant communities..."
"Western Sahara — a disputed territory in North Africa — is sealed from Morocco by a sand wall . It was built in 1987 to stop attacks from separatist troops in Western Sahara..."
"In 2007, the U.S. government pursued the idea of building a wall within Baghdad to separate neighborhoods that are predominantly Sunni or Shiite. .."
"There are even more walls and barriers. The border between Botswana and Zimbabwe is separated by an electrified fence. Malaysia and Thailand are separated by a wall, as are Saudi Arabia and Iraq, Iran and Iraq, and Kuwait and Iraq." "This article deals with fences and walls built along international boundaries, especially by rich countries which try to prevent illegal entering. The article will present different types of fences, built for different needs. Case studies from all over the world will be presented in order to show that as long as there are so many differences between countries, people will try to cross the line and those who try to halt it, will continue to build fences along their boundaries. Key words: international boundaries, illegal immigration, terrorist activities, walls and smuggling"
"Kenya is to build a 440-mile wall along its border with Somalia in a bid to keep out militants from al-Shabaab in a bid to boost security after a wave of attacks that have claimed scores of lives and brought severe criticism of the government’s response." The Lennon Wall or John Lennon Wall, "is a wall in Prague, Czech Republic. Once a normal wall, since the 1980s it has been filled with John Lennon-inspired graffiti and pieces of lyrics from Beatles' songs. "Using satellite imagery, users' pictures, video and first-hand testimony, Guardian reporters across the world chart the new walls being built to divide people from their neighbours." "We live a world of borders and walls. Invariably, the barriers are justified in the language of security—the country must be protected from the terrorists, drug cartels, insurgents, or suicide bombers lurking on the other side. Despite the external focus of these justifications, in most instances these walls and fences are actually the result of the internal politics of the state that builds them." "There are tens of millions of people in the world who have fled their homeland because of war or persecution. But there are millions more who cross borders to be with family, to retire to a warm climate, or to earn more money. Countries have the right to restrict immigration, at least in theory. The question is whether they should have this right." including his own, and to return to his country"." "What’s it like to have a towering piece of history surrounding your backyard? We asked residents of five fortified towns across the globe." "Dome of the Rock and the Western Wall in Jerusalem's old city." "The Wall is a rock opera, telling the story of Pink, a man who builds a metaphorical wall around him, isolating him from the rest of the world." in an attempt to control illegal immigration. Trump's idea has been nothing short of divisive among American voters, but the idea of erecting walls and fences to prevent people from illegally entering a country is nothing new. In fact, new border walls are being built all over the world today, and more are in the planning stages. Norway and Russia, Kenya and Somalia, Hungary and Serbia, Ukraine and Russia, Israel and Gaza, and Thailand and Malaysia." As migrants try to find alternative routes into Europe, governments are looking at how to seal their country's borders more effectively. Fences and walls have been erected at key crossing points around the world. In the US, Republican presidential candidate Donald Trump is calling for a "wall" to be built along the entire southern border with Mexico. The BBC looked at where the fences are designed to keep out undocumented immigrants." "This talk was given at a local TEDx event, produced independently of the TED Conferences. Sergei’s talk discloses the global role and fundamental interconnectedness between country borders and cultural borders in the modern society. He is answering a big question about why do social, economic and political “walls” exist and how do they evolve over time..."
"Borders Between These Countries Really Say a Lot About International Politics. If you want to learn about the relationship between two bordering countries, look no further than their physical boundaries. Some of them are natural wonders. Some are unwelcoming walls. Others are polite lines drawn in the ground that seem to simply request you not cross over without making your presence known to government officials. Aside from to revealing a lot about what two neighboring nations think about each other, these borders are also just cool to look at. Many are beautiful; others are super complicated. Take a look." Pink Floyd – The Wall "is a 1982 British live-action/animated psychological horror musical film directed by Alan Parker and animated scenes by political cartoonist Gerald Scarfe, and is based on the 1979 Pink Floydalbum of the same name. The film centers around a confined rocker, named Floyd "Pink" Pinkerton, who after is driven into insanity by the death of his father and many depressive moments, constructs a metaphorical and sometimes physical wall to be protected from the world and emotional situations around him, but soon backfires and demands himself free. The screenplay was written by former Pink Floyd vocalist and bassist Roger Waters."